Lesson #1: WHAT is Going On In Net? If you’re a Sabres fan, you were probably jumping for JOY after the Hurricanes game on Sunday. That was good, good stuff. But Sabres fans were also likely feeling VERY confused. Why does Miller look so… different? When did Ryan Miller get so short? And Swedish? And non-cranky? What’s going on? I understand. This is a really confusing situation. But don’t worry, Sabres fan. I’m here to help. We’re going to figure this out. Sabres fans, let me try to spell this out for you, in clear, easy to understand language. What we have here is, not one, but TWO GOOD GOALIES. Before you freak out, let me say that again. Not only do we have the first good goalie (Crunchy), but we ALSO have a new good goalie (Enroth). Do you get it? Here… let me try to say it another way. You know how before, when Crunchy got hurt, Lindy would play Lalime and everything would be non-stop losing and terribleness? It’s not like that anymore. Now, Lindy can play Enroth. Unlike Lalime, Enroth is good at playing hockey. Now do you understand? That’s okay. I’ve brought some helpful visual aids. Handsome, but not good. Most importantly, not relevant to the conversation. Don’t feel bad if you don’t understand at first. Take your time. This is a difficult concept to grasp. The Sabres are in the middle of a super tight playoff race, and our starting goalie is injured in some mysterious upper-body-ish type way. BUT (and here’s where it get’s tricky), all hope is not lost. You see, Enroth, appears to be really, really good under pressure. The Sabres are winning IN SPITE of Miller’s injury, because they have an additional good goalie. Get it? If you call yourself a Buffalo Sabres fan, and you’re not just a little bit in love with Jhonas Enroth, you need to go to the doctor to make sure that you actually have a heart and that you’re still capable of love. Because Jhonas Enroth is the bees knees. Jhonas Enroth is a breath of fresh air, he’s the light of our lives, he’s little cutie pie. Jhonas Enroth is adorable, and fancy, surprising, hilariously small, and (as far as I can tell) wonderful in EVERY way. Jhonas Enroth is all that and a delicious Swedish meatball. He’s AWESOME, but he is a different person than Ryan Miller. Jhonas Enroth is the effing BEST. He’s the best….except for Ryan Miller. 1 good goalie + 1 good goalie = good times. It’s science! Tune in tomorrow for lesson #2: Who the Eff are These Guys? We thought he sucked, but he doesn't. He's tiny, but he's also good at hockey. Apparently. This guy is a Sabre. Enjoying the Playoffs, Step #3: It’s Still Hockey, and It’s Still Being Performed By Hockey Players….It Can’t be All Bad. Congratulations! You’re nearly ready to watch the 2008 Stanley Cup Playoffs. Compared to the first two lessons (Temporarily Freeing Oneself From the Tyranny of the Sabres and, Facing the Reality of the Playoff Situation), today’s lesson should be relatively enjoyable. Today, we move from merely tolerating the playoffs, to embracing them fully. It’s Still Hockey, and It’s Still being Performed By Hockey Players….It Can’t Be All Bad. 2. Playoff hockey is extra badass. 4. Hockey players all grow beards during the playoffs. In conclusion, playoff hockey is extra-badass hockey performed by foxier versions of the regular-season hockey players. Yes, the playoffs would have been better with the Sabres involved, but even minus the Sabres, I see very little downside here. Solution: Quit your bitching, and enjoy the playoffs! Today we continue out reprogramming in preparation for the Sabre-less playoffs. Yesterday, we temporarily cast the Sabres aside. Today, we take our first tentative glimpse at a world of hockey that does not include our beloved team. Take a good hard look. I know it’s difficult, but force yourself if necessary. Just look at him. Face it. It is a scientific fact that Chris Drury without a beard looks like a rat-faced geek, but unfortunately, it is not beardless Drury we are concerned with today. No, today we must come to terms with the far more visually compelling and tantalizingly dangerous Drury. Today, we must face, Playoff Beard Drury. Frankly, he’s the least of our worries. The EC Playoffs are a dreadful sight to behold. Once the Sabres were eliminated from the playoffs, I was reduced to pinning my hopes on the Senators falling all the way out. Once that became a mathematical impossibility (thanks a LOT, Canes) I had to admit that the absolute worst had occurred. The Sens, the Flyers, the Rangers, and the Caps, are ALL in the playoffs, and the Sabres are done. The scope of the disaster is still difficult to comprehend, but this is the situation that the Hockey Gods have handed us, and this is the situation that we must accept with grace and dignity. I see two reasons for hope. The second reason for hope is the Western Conference. The Western Conference is jam PACKED with teams I know nothing about, and therefore don’t hate. This is kind of a mixed blessing because while I don’t hate most of those teams, it’s like starting from scratch. I have nothing to grab onto and no point of reference. All I know is that I don’t want Brian Campbell to win the Cup, so that eliminates the Sharks, and I am grossed out by the Ducks….but after that, the competition for my heart is pretty wide open. This week I have to work every evening, so I will miss all the early starting games, but I’m pretty excited to watch the late start Wild/Avs series once I’m nestled back into TWC Headquarters each night. 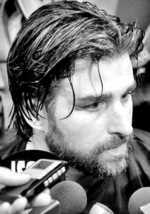 So, the situation is this: Chris Drury is going to be skating around with his fetching play-off beard being all hot and clutch for the DISGUSTING RANGERS, and it is almost certain that somewhere along the way, a team I hate will win a playoff series. On the other hand, particularly in the Western Conference, there is a lot of opportunity for a yet-to-be-discovered team to capture my fancy. It’s not a good situation, but now that I’ve sat down and faced the cold hard facts, I think I’m beginning to believe that I can do this. I can watch the playoffs even if the Sabres aren’t involved. I hit a low point on Sunday night. In a state of desperate disillusionment and hockey despair, I sent out a pathetic email to Patty, Heather, and the Ookies declaring that my heart was broken, I couldn’t go on, and that I would not be able to stomach the playoffs this year. All of these ladies have many years of fandom under their belts, and they all offered up very good advice and sympathy. They also all agreed that this year the playoff scene legitimately blows, and many amongst us are going to have to get creative about choosing sides. By using their expertise, along with a careful assessment of my own needs, I believe I have devised a three-day plan to ease myself out of the Sabres season, and into the (pathetically Sabre-less) playoffs. I don’t think I can watch the playoffs without some rooting interest, and obviously my normal rooting interest is not available for rooting, so, I’m going to have to root for someone I normally root against, which is a situation I would never root for, but rooting is a weird thing, and sometimes when you can’t root where you’ve laid your roots, you have to pick up your roots and root elsewhere. Ya know? Bottom line: I will love the Sabres above all other teams for ever and ever, Amen. By virtue of their suckiness, the Sabres have abandoned us, and we are now alone and adrift in a continuing hockey season without them. They have left us no choice but to look elsewhere, and to take solace in the arms playoff series of another team. One thing my 32-years on earth has taught me is that before moving forward, we must heal the wounds of the past. Today, I say goodbye (and good riddance) to the 2007-08 Buffalo Sabres. It is with a heavy heart that I write you this letter. Together, as team and fan, we’ve had quite a year. Well, I had quite a year, you mostly just skated around, not scoring or winning. (Okay, that’s not quite fair. You scored a ton of goals, and you won enough to keep things interesting right up until the end. That’s not nothing, I suppose.) What I’m trying to tell you is that I do not regret the season we have shared. It’s been awesome, and I can’t WAIT until next year. I think that at this point we can all agree that a little time apart might do us some good. You go, have a great summer. I hope you make a ton of new fans. Meanwhile, I’m going to check out some other NHL teams. This isn’t how I wanted it to be, but I’m not getting any younger here. I’ve missed out on watching a lot of Stanley Cup Playoffs already. I can’t miss another year. I’m going to watch the playoffs, and I’m going to be cheering for some other team; I don’t see any point in pretending otherwise. So, let’s just agree to go our separate ways until the playoffs are over. We all know that this separation is only temporary and at that I’ll probably find a way to freak out about the pending free agency of Dmitri Kalinin within MOMENTS of the end of the Finals, but let’s just do ourselves a favor and save the drama until then. M’kay? Stay tuned for Step #2: Facing the Reality of the Playoff Situation.